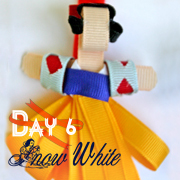 Snow White is super cute with her diamond slitted sleeves and curled bob hair. Light Blue: Two pieces of 1½ "
Red: Three pieces of 1½ "
Yellow: Six pieces of 4"
2. Take your 2½ " piece of black ribbon and curl the ends into tiny rolls like so. Glue in place. 3. Wrap black ribbon around head and glue at top and sides. 4. Take one of your red 1½ " pieces of ribbon and roll then glue ends together. 5. Cut in half lengthwise so you have two rolls. Discard one roll. Spray other roll with no fray spray. 6. Place a dab of glue in the center of one red roll and glue center together. 7. Glue that piece to the back of your head. 8. 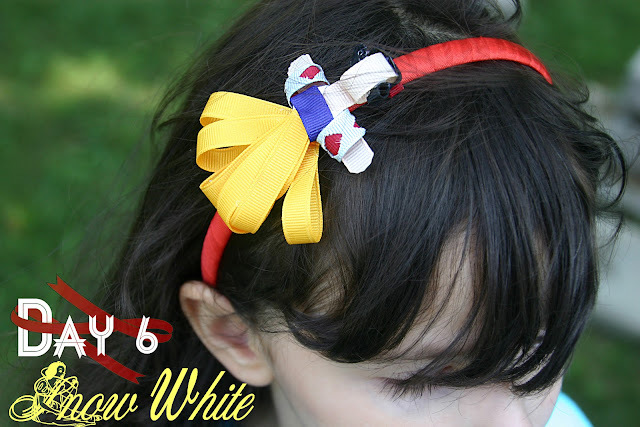 Take your white 2" piece of ribbon and glue to front of body at an angle. Wrap around and glue other end to front of body. 9. Take your 2" piece of glue ribbon and glue end to back. 10. Wrap around and glue other end to back. 11. Take your 2¼ " piece of flesh colored ribbon and cut rounded ends. This will be your arms. Spray with no fray spray. 12. Glue arms to back of body. 13. Take one of your 1½ " pieces of light blue ribbon and fold end over. Cut a triangle slit so that when you open it up it forms a diamond shape. 14. Do it again on other end. Repeat for other 1½ " piece of light blue ribbon. Then glue the light blue ribbons to the 1½ " pieces of red ribbon. 15. Glue one end of the light blue and red ribbon to the back of your arms to the side of the head. 16. Wrap around arm and glue other end to back of arm. This will be her sleeve. Repeat for other sleeve. 17. 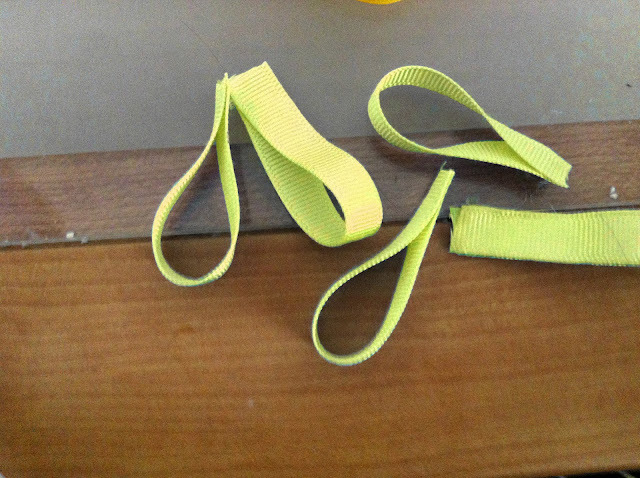 Take your six piece of yellow 4" ribbon and fold in half gluing ends together. 18. Glue one yellow ribbon to her body under the blue ribbon. 19. 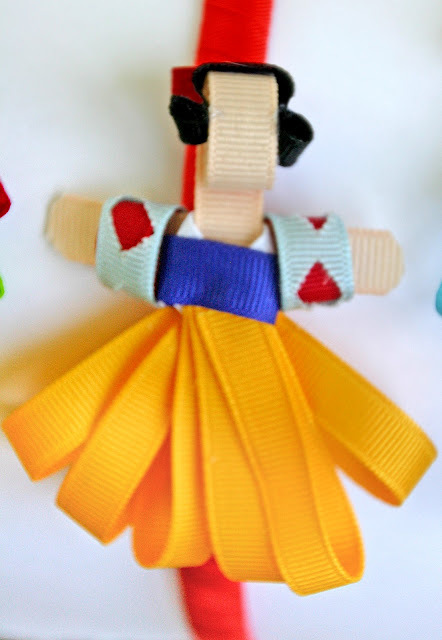 Glue the rest to her body under the blue ribbon in a fan shape. You need three pieces of red. Thank you for sharing! We are planning our first trip to Disney - this may make the trip with us :) I have linked to this post on my blog at ajperspective.com/blog! These are SO stinkin' cute, and seem relatively simple to make. Thanks for the easy to follow tutorial! You're going to make a lot of little girls happy!! I made this one for my 4 yr old and she loves it. I made some modifications though knowing that my girls might fight over it. Instead of using hot glue I used permanent fabric glue, which takes longer to dry, but I used clothes pins to hold each section together and took my time making it in about a week. I also had to glue the rough side of velcro to the underneath of the headband I bought so it wouldn't slide off her head since she has fine hair. Great tutorials! Can't wait to make the next one! She has requested Jasmine next.